The man and woman were likely buried facing each other in Italy in the 5th century A.D.
A pair of skeletons still holding hands was found recently in Italy. The man and woman were buried at the same time between the 5th and 6th century. Two skeletons found in central-northern Italy reveal the couple was buried holding hands some 1,500 years ago. The skeletal remains of a Roman-era couple reveal the pair has been holding hands for 1,500 years. Italian archaeologists say the man and woman were buried at the same time between the 5th and 6th century A.D. in central-northern Italy. Wearing a bronze ring, the woman is positioned so she appears to be gazing at her male partner. "We believe that they were originally buried with their faces staring into each other. The position of the man's vertebrae suggests that his head rolled after death," Donato Labate, the director of the excavation at the archaeological superintendency of Emilia-Romagna, told Discovery News. The tender discovery was made during ordinary construction work in Modena and was announced this week. Labate explained the dig revealed three layers of scientific interest. The deeper layer, some 23 feet below the surface, contained the remains of Roman-era structures, including a calcara where mortar was produced. The ruins belonged to the suburbs of Modena, then called Mutina. "A middle layer, at a depth of about 10 feet, featured 11 burials, while a third stratification on top of the necropolis, revealed seven empty tombs," Labate said. 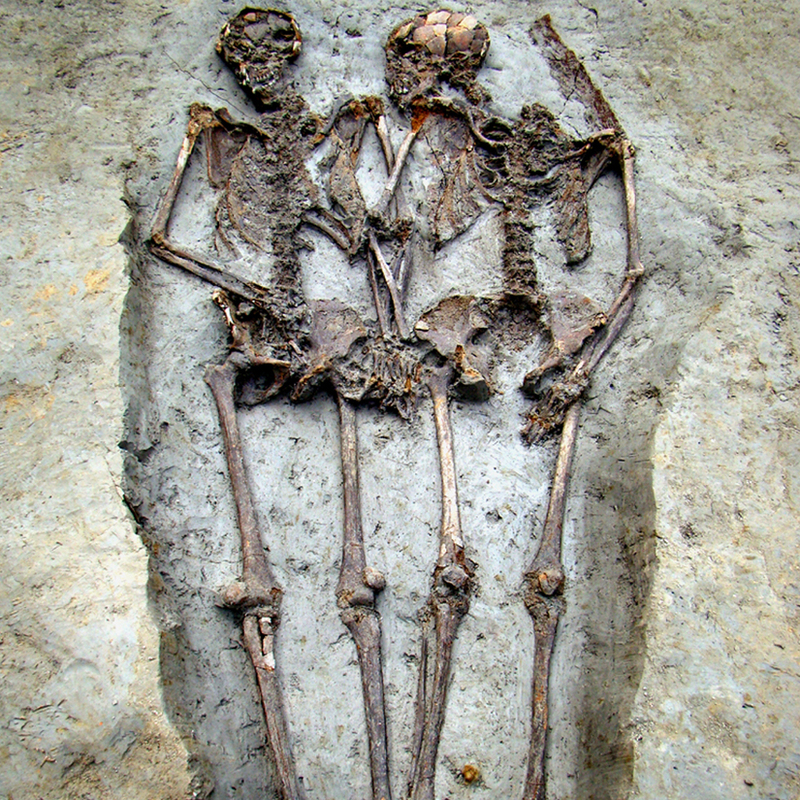 Excavated by archaeologist Licia Diamanti, the skeleton couple belonged to the 11 tomb necropolis. According to Labate, the simple fossa (trench) tombs suggest that the people buried there were not particularly rich. "They were possibly the inhabitants of a farm," Labate said. The area was subjected to several floods from the nearby river Tiepido -- which may have caused the male skeleton's skull to roll away from the female skeleton after burial. The necropolis was covered by alluvial deposits, and on top of them, another seven tombs were built. "These burials were empty. Most likely, they were covered by another flood just after their construction. We think it was a catastrophic flood which occurred in 589, as reported by the historian Paul the Deacon," Labate said. The two skeletons, which are poorly preserved, will be now studied by Giorgio Gruppioni, an anthropologist at the University of Bologna. The research includes establishing the couple's age, their relationship and the possible cause of death. "In antiquity, it is not surprising to learn of spouses or members of a family dying at the same time: whenever epidemics such as the Black Plague ravaged Europe, one member of the family would often die while the family was trying to bury another member," Kristina Killgrove, a biological anthropologist at the University of North Carolina, told Discovery News. In 2007 another skeleton couple, buried between 5,000 and 6,000 years ago, was found at a neolithic site near Mantua, just 25 miles south of Verona, where Shakespeare set the romantic story of Romeo and Juliet. Locked in a tender embrace, they also looked at one another in apparent defiance of time and decay. "The two couples are separated in time by five millennia, and both evoke an uplifting tenderness. I have been involved in many digs, but I've never felt so moved," Labate said. According to Killgrove, the positioning of the Modena skeletons, looking at one another and holding hands, indeed suggests they may have been a couple. "Whoever buried these people likely felt that communicating their relationship was just as important in death as it was in life," Killgrove said.